for wholesome social interaction for our members, and present a positive image of the gay community in New Hampshire. Our amazing Spring 2019 Concert Series is almost here! Plan now and reserve your tickets. Mark your calendar and plan now. Our spectacular 21st annual Spring Concert Series – We’re 21… We’re Legal! – is almost here! You can purchase and reserve your will-call concert tickets here on our website. We give the following four performances. For more details, go to our Upcoming Performances page. To reserve your tickets, go to our Tickets page. For more information go to our Upcoming Performances page. On Wednesday morning, April 17, NHGMC performed several songs for Governor Chris Sununu and the Executive Council at the New Hampshire State House, Concord. Last year, NHGMC made history when the Chorus performed inside the Capitol building for the first time, at the Governor’s personal invitation. Thank you, Governor Sununu. What a great holiday concert series! Thanks for making it such a smashing success. Heartfelt thanks goes out to all our friends and audiences in Nashua, Portsmouth, Concord, and Manchester for a exceedingly successful 2018 Holiday Concert Series, Don We Now Our Gay Apparel. With each season, our audiences are grow larger and larger — packed audiences this time in Nashua and Concord! You energize us and we love singing our hearts out for you. Thanks also to New Hampshire Governor Chris Sununu and Congressman-elect Chris Pappas for attending our Manchester concert. If you like to sing, audition and join us for our Spring 2019 Concert Series. Or talk to us about becoming a support-staff volunteer. We’re in our 21st year. Thank you for a wonderful 20th Anniversary year celebration! Our 20th Anniversary year has slipped into history. But on July 1, 2018, NHGMC’s third decade began! What a year of incredible celebrations with our friends and fans it has been. And our loyal corporate sponsor, TD Bank, has been there every step of the way. We are stronger and more popular than ever. The best is yet to come. On Wednesday, March 21, 2018, NHGMC sang several songs for Governor Chris Sununu and his Executive Council inside the New Hampshire State Capitol! Governor Sununu, in commemoration of NHGMC’s 20th Anniversary, personally extended the invitation to the Chorus. A very historic, proud moment for our members, it’s the first time the Chorus has performed inside the Capitol — and Governor Sununu is the first New Hampshire Governor to extend the invitation to sing for our state government. It marks an important milestone in our history, given that this performance would have been unthinkable in NHGMC’s early years — or even as recently as 10 years ago — when acceptance of LGBT people in New Hampshire was scarce. To open the Council session, NHGMC performed three songs — the official state song, Old New Hampshire, as well as I Sing Out and Let the River Run. Following the televised performance, the Governor read, and then presented Artistic Director Luc Andre Roberge with, a 20th Anniversary Commendation signed by the Governor and the five Council members. We thank Governor Sununu, the Council, and his staff for their warm welcome, hospitality, and recognition of our 20th Anniversary. Of the dear old Granite State! NHGMC, for the first time in its history, sings the National Anthem at Fenway Park for Boston Red Sox! It was a night to remember — our Chorus, for the first time in its history, belting out the National Anthem at Fenway Park on June 9, 2017, to open the Boston Pride Night baseball game against the Detroit Tigers. And the Sox came from behind to win! An exciting new milestone for NHGMC as well as a dream come true. Thanks to the Red Sox organization for inviting us. Thanks to our friends and fans for your support and all the compliments. On December 12, 2017, WMUR-TV’s award-winning “New Hampshire Chronicle” re-aired a delightful feature story on the NH Gay Men’s Chorus and our 2016 holiday concert series, “Holiday Music to Warm the Heart.” The Chronicle TV crew had interviewed many members and a few of our performances. 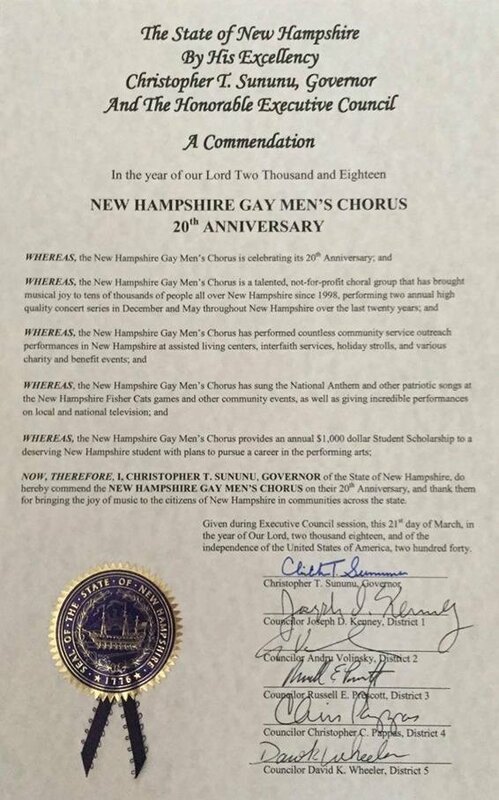 WMUR’s description of the story: “Singing out love and holiday cheer … For 19 years The New Hampshire Gay Men’s Chorus has been sharing their voices, music, and message of acceptance and love with the people of New Hampshire.” The story originally aired on December 16, 2016. It ranks as one of the most wonderful moments in the history of NHGMC. On February 5, 2016, our men belted out the national anthem and God Bless America on live, national television — broadcast on C-SPAN from the Verizon Arena at the Democratic Party’s McIntyre-Shaheen 100 Club Celebration, featuring speeches by candidates Hillary Clinton and Bernie Sanders, as well as Governors Hassan and Lynch, Senator Shaheen, and other dignitaries. Thank you NHDP for the invitation to sing at your event. Thanks also to all in attendance and all who watched on television. We were so touched by your applause, praises, and kind words. Watch our guys in this C-SPAN video perform at this event. Never in our 19-year history have we experienced anything quite like it. Enjoy.